Hi, everyone. I wanted to let you know I’ve updated and refreshed my website, http://www.shanegericke.com. The biggest single change was updating my appearance schedule, but the rest of the pages were swept, dusted, and vacuumed, something I’ve neglected terribly in the past year with the passing of my wife, Jerrle. But, it’s done, if you see any typos, errors or other errata I missed, please let me know at shane@shanegericke.com. Fun note: I’ll be adding some cool new content soon, so stay tuned. 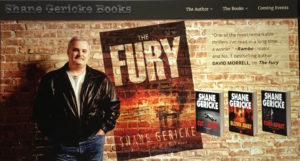 All four of my thriller novels–The Fury, Blown Away, Cut to the Bone, and Torn Apart–are now featured on my Home Page, since the backlist books have been redesigned, freshened, and are now available at Amazon and BN, in print and eBook formats, just like the new thriller, The Fury. I’d be well pleased if you’d stop by for a cup of digital coffee, browse the aisles, and let me know what you think. Thanks so much, and enjoy!